A second international rail connection between China and Kazakhstan was officially inaugurated on December 22, when two special trains were operated to the border crossing at Korgas in Xinjiang province. The break-of-gauge transfer facility forms part of a free trade zone at Korgas, known as the International Centre for Transfrontier Co-operation. Completed towards the end of 2011, the trade zone was formally opened on April 18 2012. Located 670 km west of Urumqi, the capital city of Xinjiang province, Korgas lies 90 km northwest of Yining, the principal town in China’s Ili Kazakh autonomous prefecture. It is served by a 292 km electrified branch which leaves the Urumqi – Alashankou line at Jinghe, built at a cost of 6bn yuan. Tracklaying on the branch had been completed in September 2009, and the section from Jinghe to Yining opened for passenger traffic in June 2010. Construction of the corresponding 293 km branch from Zhetigen on the Kazakh side was originally to be undertaken through the China Gateway PPP project, but the work was subsequently taken over by national railway KTZ. Tracklaying was completed in December 2011, with a privately-operated passenger service introduced as far as Altynkol in September. 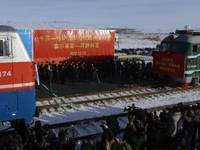 Opening of the second border crossing is expected to enhance rail traffic between China and Central Asia, and thence to Europe. The existing crossing point at Alashankou/Dostyk handled 15·6 tonnes of freight in the 10½ months to November 18, split between 9·9 million tonnes moving west from China and 5·7 million tonnes heading east. The Korgas crossing is also expected to handle around 15 million tonnes a year initially, with a long term target of 30 million tonnes.